The incident occurred on Wednesday soon after the clip went viral. 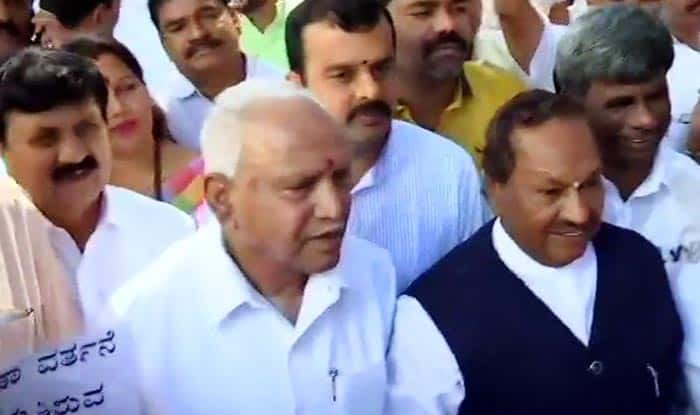 Bengaluru: A BJP delegation on Thursday submitted a memorandum to the Governor over the incident of stone-pelting at the residence of party MLA Preetham Gowda, allegedly by JD(S) workers, the previous day. Reports say the incident occurred after an audio clip, purportedly carrying the voice of Gowda, went viral. The delegation, led by BS Yeddyurappa, marched to Raj Bhawan to submit the memorandum to the Governor. JD(S) workers on Wednesday pelted stones Gowda’s residence. One BJP worker got injured in the incident. According to media reports, in the audio clip, Gowda can allegedly be heard commenting on the health of JD(S) chief H D Deve Gowda. However, Gowda claimed it wasn’t his voice. The clip reportedly had Gowda telling a man named Santosh that JD(S) chiedf Deve Gowda “would die soon” and Chief Minister H D Kumaraswamy “is unwell” and that JD(S) “will soon be history”. “I have asked the police to probe the matter and take strict action,” he said.